The sunshine state is home to numerous motorcyclists, and is a destination point for many others who long for the open road and pleasant temperatures. But riding the Florida highway is more than fun and games. In fact, Florida holds the dubious honor of leading the country in motorcycle fatalities. Here’s another interesting tidbit: although most bikers purport to wear a helmet when riding, less than half of them were actually seen wearing them on the road. That’s a big problem, since four out of ten motorcycle fatalities involve individuals who are not wearing a helmet. Halloween night 2017 was the last time one man ever rode his Harley. That was the night he collided with another vehicle in a busy intersection, sustaining life-threatening injuries that led to his death. He was not wearing a helmet. On the same night, a married couple on their motorcycle crashed into a vehicle that pulled out unexpectedly in front of it. The driver of the bike was seriously injured. His 33-year old wife killed. She was pregnant. Neither of them was wearing a helmet. Don’t ride with people you don’t trust. If you think your buddy is a lot of fun, but tends to be wild on the road, don’t share the lane. Make yourself visible. Wear bright clothing and a helmet, and keep your headlights on. Stay off the road if you’re tired. Know yourself, and pull over before the drowsiness hits. Keep a minimum of 20 feet between yourself and fellow riders. Be especially cautious around semi trucks. Besides the obvious problem of not being seen by big rig drivers, wind turmoil can catch you unaware. Wear the right gloves. Your gloves need to fit properly so you don’t have problems with your clutch when an emergency arises. 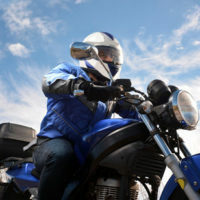 If you or a loved one is involved in a serious motorcycle accident, and if that accident was the result of another driver’s negligence or recklessness, you may be entitled to financial damages to assist with expenditures associated with the accident, as well as with the emotional trauma and other costs. At Barbas, Nunez, Sanders, Butler & Hovsepian, our experienced team will help you through the legal process in order to secure the best settlement possible. Contact us in Tampa for a free consultation today.